We proudly presents you a perfect solution for converting the 16-bit/32-bit PC Card to standard ExpressCard/34. 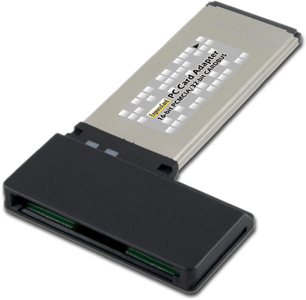 It accepts 32-bit CardBus/16-bit PCMCIA PC Card and supports PCI-E interface. It supports any kinds of PCMCIA and CardBus PC Card applications, such as 16-bit memory card adapter, ATA card, 32-bit 3G/3.5G I/O card, wireless I/O card, etc. It is a very convenient device for any Notebook or PC equipped with ExpressCard socket to use PC Card. 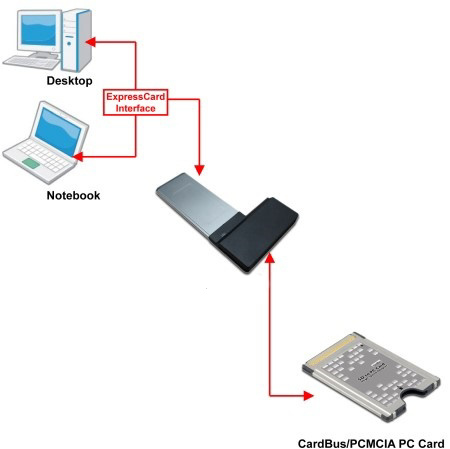 Any CardBus/PCMCIA PC Cards can be accessible. Hot swap support - cards can be plugged and unplugged without system power-off or reboot.